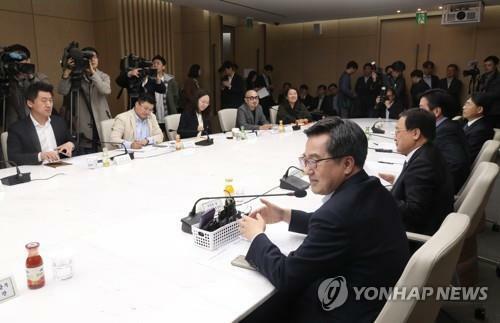 SEJONG, Oct. 24 (Yonhap) — South Korea’s government said Wednesday that it will provide more financial assistance and tax incentives to boost sluggish facility investment, accelerate deregulation, stimulate innovation-led growth and create jobs. The finance ministry said the current slump in the job market and facility investment could further worsen down the road due to the deepening trade war between China and the United States, a slowing down of China’s economy and rising oil prices. Also, the rate hikes in the U.S. could deal a blow to the financial markets of the emerging economies and cause fallout for their real economies. Under the set of measures, the private sector-led investment projects would be implemented faster than scheduled, and a total of 15 trillion won worth of financial help will be unveiled to help companies increase investment. The Korea Development Bank (KDB) and other policy banks will extend the financial help equal to 80 percent of the money needed, according to the ministry. The government will moreover seek to renovate industrial complexes in the country, with some 600 billion won expected to be spent on the move. Seoul will raise its planned budget spending on areas, such as security, renewable energy and environment, to 26 trillion won next year from this year’s 17.9 trillion won. The latest action plan comes as concerns are growing over the possibility of Asia’s fourth-largest economy pulling back due to a sharper-than-expected contraction in facility investment and employment market troubles. Last week, the Bank of Korea (BOK) trimmed its economic growth outlook to 2.7 percent for 2018 from its earlier projected 2.9 percent. It is lower than the finance ministry’s 2.9 percent outlook and the International Monetary Fund’s 2.8 percent prediction. The South Korean economy expanded 3.1 percent in 2017 and 2.9 percent in 2016. The downward adjustment came as the latest economic numbers reflected the disappointing job market and deepening trade tensions between the U.S. and China. The number of newly added jobs fell to 17,000 in the third quarter of the year, plunging from a 101,000 gain three months earlier. For all 2018, the BOK expected 90,000 new jobs to be created, sharply down from an 180,000 estimate made just three months earlier. Corporate investment has slowed down rapidly as second-quarter facility numbers dropped 5.7 percent on-year and will likely decline by 0.3 percent at the end of the year. 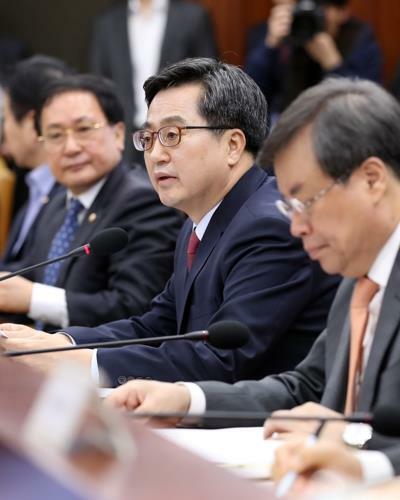 The finance ministry also said the government will provide 1 trillion won worth of credit guarantee for the auto parts makers, as well as 300 billion won for the shipbuilding-related companies. Some 360 billion won worth of a new fund will be created next year to support the culture and content industry as well. The ministry then said the government will temporarily lower fuel taxes by 15 percent for six months, which would reduce the tax burden for people by some 2 trillion won. In a meeting with businessmen, the country’s top economic policymaker also promised to make efforts towards deregulation in a way to foster a sharing economy. But he stressed that shared growth is also important among interested parties. Recently, tens of thousands of taxi drivers staged a massive rally in central Seoul as part of their one-day strike against IT giant Kakao Corp.’s plan to start a commercial carpool service.